Queensland's Gold Coast has many labels. It's known as one of Australia's premier seaside and resort destinations; it's famous for its major events, and it's loved as the theme park capital of the country! But did you know it's also a foodies paradise, and the perfect location for a romantic weekend away. Mention the Gold Coast to some people and they'll immediately think, Surfers Paradise. Surfers has been an important Gold Coast resort for decades and is always a hub of activity. However, just down the road at beautiful Broadbeach, you'll discover the most romantic of settings for a weekend away you'll never forget. 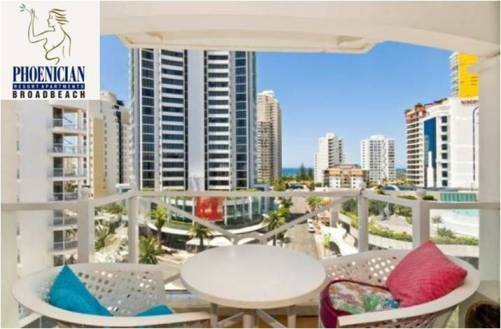 Broadbeach is just delightful, with a wonderful beach, parks, restaurants and cafes. Whilst having every modern amenity you could wish for, it's somehow managed to retain its traditional charm, with less high-rises than Surfers, and some of the original beach homes still in situ. What's even better, is that you can grab some amazing holiday deals on luxury Broadbeach accommodation. Book a romantic weekend and do as much or as little as you like - it's all here if you want it, but there's plenty of peace and privacy, too. 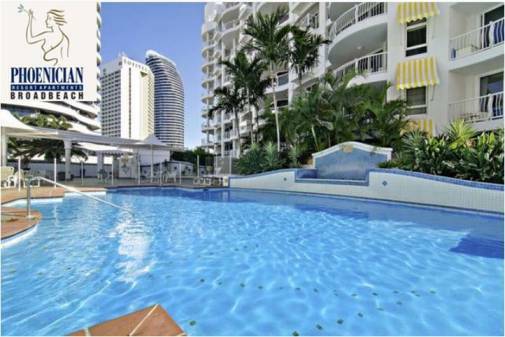 When you're looking for accommodation Broadbeach apartments are very impressive. Just steps from the beach, you'll find self-contained, luxury one or two bedroom apartments with queen-sized beds, luxury bathrooms, lounge areas, fully equipped kitchens, private balcony, Austar and more. Take a look at the facilities, and you'll be even more impressed! Take the Phoenician Resort, for example, with not one but TWO swimming pools, one of which is heated. In fact, you could spend the entire weekend within the resort and still have an amazing time! However, that would be a bit of a shame, as Broadbeach offers some great amenities and attractions. You'll find that most Broadbeach accommodation is close to the beach, so that's a great place to start your romantic weekend. What could be more relaxing upon arrival than a sunset stroll along the sand, watching the sun sink into the ocean, and the twinkling Gold Coast lights appear. Perhaps you'll stop for a cocktail or a glass of bubbles at one of the many beachside bars, before heading for the famous restaurant strip, where you'll discover some of the best Gold Coast restaurants. Almost every type of cuisine is represented here, from silver service to takeaway, so you'll always find something to suit your taste and your budget. It's just a gentle stroll back to your Broadbeach accommodation, where you'll enjoy an excellent night's sleep in your peaceful, private surrounds. With two full days ahead of you, what will you choose to do? Breakfast on your private balcony, or head out to one of the many beachside cafes for a feast of bacon and eggs, while you plan the day's activities. To get the best of all worlds, why not take a trip out to the breathtaking Gold Coast hinterland? Just 30-40 minutes from your Broadbeach accommodation, it's like going to another world! With the beaches and ocean behind you, you'll discover stunning mountains and lush valleys, filled with rainforest, waterfalls and picturesque villages. Discover local art and crafts, visit a hinterland winery, browse the antique shops and enjoy a traditional morning tea or delicious lunch at one of the mountain top eateries. The clean mountain air and sensational views will leave you feeling relaxed and renewed. Closer to home you'll discover heaps of things to see and door. The Gold Coast is renowned for its shopping facilities, with both Pacific Fair Shopping Centre and the Oasis Shopping Centre within easy reach of your apartment. If action-packed adventure is your thing, there's plenty of that, too, from the many Gold Coast theme parks, to helicopter rides, speed boat tours and deep sea fishing. One thing's for sure, you don't need to be a kid to enjoy the theme parks! From Warner Bros Movie World, to Sea World, Dream World and Wet 'n' Wild, the fun never stops. And with a multi theme park pass, you can visit them all while saving heaps of cash. For something a little slower, why not hire a motor boat or kayak, or take a romantic dinner cruise. For a Saturday night to remember, you really should visit Jupiter's Casino. Have a flutter or simply enjoy the casino's amazing facilities, which include four top class restaurants and international shows and entertainment. Sunday may be a day of rest but, if you're in Broadbeach, you really should visit the amazing Sunday markets. Packed with colour and curiosities, the markets are home to a wide range of stalls, from plants and local produce, and arts and crafts, to clothes, jewellery and home-baked goodies. Grab a coffee or a cool drink, and browse to your heart's content, picking up something special to remember your very romantic weekend in beautiful Broadbeach.